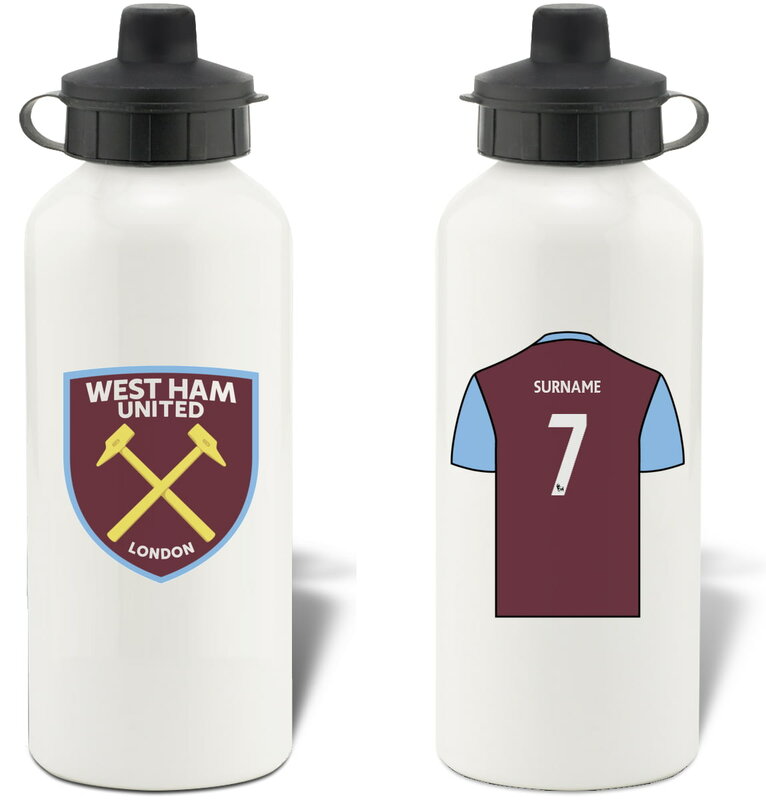 This officially licensed water bottle is approved by the club themselves and features the West Ham United FC crest on one side and a personalised West Ham United FC shirt on the other. You can personalise the shirt with your chosen name (up to 12 characters) and number (2 digits), making this item perfect for school, the gym or the sports field. Available as a stylish silver or white water bottle, this item is fashionable and robust - the perfect gift for any West Ham United FC fan, or a practical treat for yourself. Our personalised water bottles are made of 100% aluminium, so you know that they are tough and can withstand being banged around in your bag. Bottle is supplied with both screw top lid and push-pull lid and also includes carabiner spring hook so you can easily attach it to your backpack. 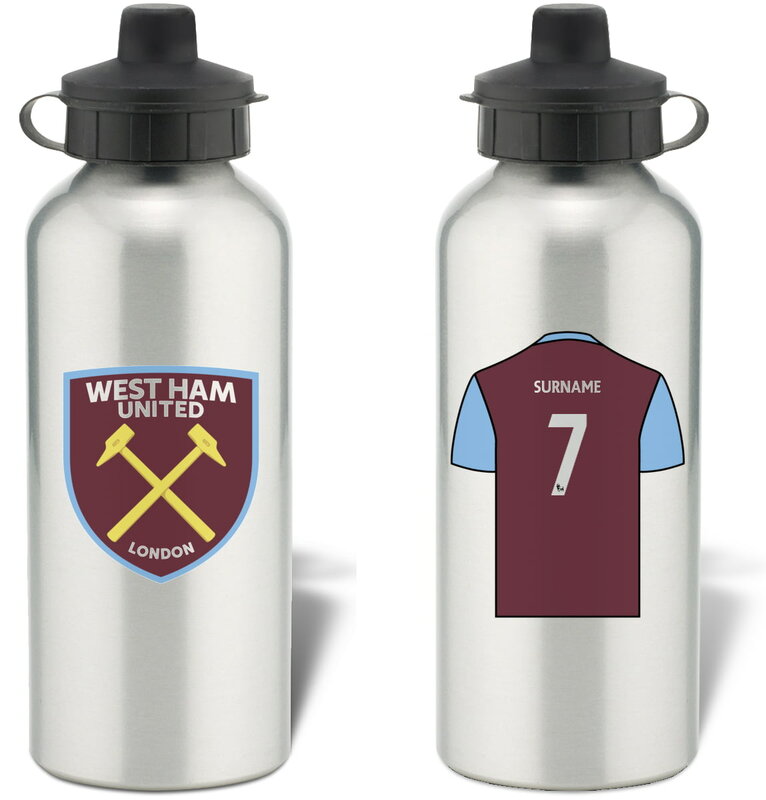 Keep yourself hydrated in style with your own personalised West Ham United Retro Shirt Water Bottle. Keep yourself hydrated in style with your own personalised West Ham United FC Bold Crest Water Bottle. Keep yourself hydrated in style with your own personalised West Ham United Evolution Water Bottle. This truly stunning engraved hipflask is a fabulous present for any West Ham United FC fan and is an approved and fully licensed product. This truly stunning gift is sure to raise a smile as the recipient sees their personalisation on the West Ham United Retro Shirt Mug. One of our best-selling West Ham United FC gifts of all time, this personalised dressing room print is the ultimate must-have gift for any West Ham United FC fan.